As part of the University of Manchester, the Grade II listed Whitworth Art Gallery reopened its doors on 14 February 2015 following a £15 million major refurbishment and extension, designed by architects MUMA. Prior to the most recent renovations, the gallery had been designed for 100,000 visitors annually but visitor numbers had nearly doubled reaching 190,000, making some parts of the gallery unpleasantly congested. 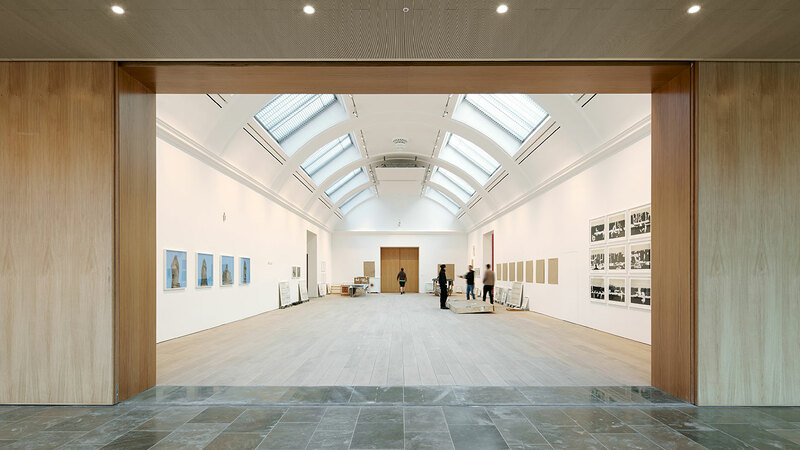 Suspended ceilings covering vaults and roof lights made for large dark galleries, the blank gable ends were attracting graffiti and storage problems had become acute making the refurbishment and extension vital to the future success of the gallery. Ramboll carried out full structural and civil engineering services for the Whitworth renovation that included refurbishment to the existing Grade II building as well as an extension. Renovation of the existing building included opening up the existing exhibition spaces to create more light and space; this was achieved partly by the restoration of three barrel-vaulted ceilings that had been hidden by suspended ceilings since previous renovations in 1960’s. To the rear of the existing 19th-century building, the extension consists of two wings of contrasting character that extend into the park, one glass and stainless steel and the other red brick. The new Landscape Gallery provides an urban edge with a red brick exterior and large zinc-clad north facing window that provides an important source of natural daylight. Light control mechanisms were added to the window as well as the roof light for flexibility. The simple appearance of the completed “north light” structure is deceiving; the zinc- clad conceals a complex steel structure consisting of several trusses, the longest spanning approximately 25m to provide a large column-free space below. Used for a wide range of exhibitions, including large and heavy sculptures, Ramboll worked closely with the gallery staff to develop a set of loading criteria that will allow the Landscape Gallery to be used flexibly, whilst providing a cost-efficient structural solution for the suspended concrete slab. Working closely with the architect and specialist fabricator, Ramboll developed the design of the bespoke stainless steel mullions that support the café roof steelwork. The mullions form the primary loadbearing vertical elements and have a highly reflective polished surface, creating a highly glazed space that is free of traditional columns. A sample mullion was produced in order to verify that the fabrication process could achieve the necessary tolerance and finish and to prove the novel structural design. This early investment by the client enabled the most efficient, slender and economic design to be developed and ensured the fabrication of the structural mullions would fit within the overall construction programme. A bespoke stainless steel brise soleil shades the west-facing glazed promenade and was designed to reduce glare and solar gain in the galleries to prevent overheating. The aim was to provide a delicate structure that would perform this function without obscuring views over Whitworth Park. Ramboll undertook the final detailed design of the brise soleil; carrying out detailed computational fluid dynamic (CFD) analysis during the early stages of the project to calculate a reduced wind load specific to the brise soleil, allowing more slender stainless steel fins to be designed. The finished brise soleil was also designed to flex slightly under wind loading, adding to the illusion of a lightweight, dynamic structure. The much needed renovation doubles the gallery, learning and storage zones of the 125-year-old gallery and the appeal of the newly developed building resulted in record-breaking visitor figures following its reopening. The judges of the ArtFund Museum of the Year Award agreed that ‘the transformation of the Whitworth - architecturally, curatorially, and as a destination – has been one of the great museum achievements of recent years’. The Whitworth is shortlisted for the RIBA Stirling Prize, the UK's most prestigious prize for new buildings. The winner will be announced on 15th October and will be chosen by a select line-up of judges but the BBC, in partnership with the RIBA, is inviting you to vote for your favourite. The most popular building will receive the 'People's Choice' vote, the result of which will be announced after midday, also on Thursday 15th October. You can vote for The Whitworth here.